King Loudness's review"A reasonable LP facsimile "
The Epi standard is made in Korea. The 2 vol and 2 tone controls allow for easy tone variation at your fingertips. I'm more of a strat guy, so LP's have never had the best upper fret acess for me. The coupling of a beefy neck defineily hinders speed on an LP neck, but that doesn't mean it can't be done, just look at John Sykes! The lack of comfort cuts might bother players more comfortable with strats, but that's also part of an LP's charm, that large mass of wood. Although I've played many LP's that didn't sound or play that great, one thing that you can be sure of is that an LP will sound big, and have a low mid emphasis, just because of the wood mass and body/neck construction. My Epi is about 9 lbs. Pretty hefty! I go for a Marshally, Modded Plexi type tone with most of my guitars, but I find that my Epi performs better under lower gain settings, where the fat LP tone can take over. The pickups are OK. Nothing spectacular about them, but at the same time, they aren't horrible. The bridge delivers on 70s hard rock ala Thin lizzy, but it get's muddy under high gain applications. The neck is a bit better for that, but it still tends to have too much lows. Cleans are quite warm, if a bit characterless, and safe. An Epi LP is a good introduction to Les Pauls, if you're on a budget. With a good setup, and new pickups, you can definetly find keepers, unfortuantely mine was not one of them. 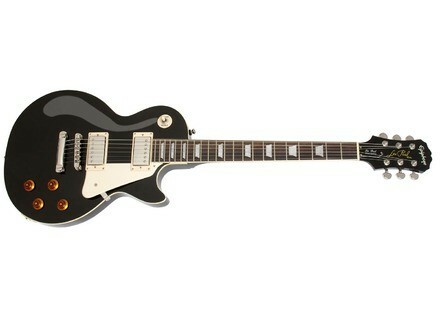 One of the best LP's I've ever played was a Zakk Wyled sig, though, so it can be done at a lower price point. blind Boy's review (This content has been automatically translated from French)" I had a dream ..."
Electric guitar Mahogany body, Maple top, bolt-on mahogany, rosewood fretboard, 22 frets, neck and bridge humbucker. Scale: 628mm, Width at nut: 42mm, chrome hardware, Colour: Cherryburst. I used it for 3 years every day, then enter working life that I touched no longer so only intermittently. I also did two years with stage and this is where its limits were found. I finally worked on a self-produced album with, or combined with the effects of 4-track recorder, I got something coherent ... in the words of the guy who completely mastering my tracks. This guitar, I also loved for its aesthetics, and despite the overall quality of all a bit cheap, I spent hours with pure pleasure. I said low end in terms of what is installed on the imitated, THE Gibson Les Paul style! It is a beautiful gift we m'à is there all the same, and the same means, I will be also paid me a copy rather than the original. fabc14's review (This content has been automatically translated from French)" A good surprise"
The handle is nice to play with strings 10/46, I set the action low and I only have a few small boxes frizz, inaudible on my Laney LC15 or records. This does not impact the game or sound, I left the setting as this. The finish is successful, only the rosewood is a bit dull, but it must be arranged. After, bah it's seen and ratavu, access to acute rather lame, bridge and tailpiece classic. The clean sounds are correct, but hey, if you want pure sound of madness, you buy a strat and then you stop tinkering. The Les Paul is made for big sound and that's why we love him. In My Laney LC15 she is doing very honestly I must say. I did not expect to find a sound like that. By the gain of the amp and the guitar volume way down (just), we timidly approach the myth and the ridiculous price of this used guitar, hat Epiphone. The bridge pickup is the most successful, it enters all large distortion effects and keeping a good definition. on the other hand, it can not be said of the neck pickup. we quickly right with porridge when he asks too much. I'm addicted to my stratocaster, but now, forced to confessed that Epiphone has something. I'll change the neck pickup to be sure, buy him a pickguard and buttons more to my liking, and then we will be faced with a very fine specimen that will give me that "vintage noiseless" my strat does not have namely a big sound very fat. The whole is coherent for a quality / hard to beat, at least on this model money, and yes I would do this choice.